The WPI community has seen many newcomers in the past couple of months. In addition to the new faculty and staff, as well as the Class of 2022, Katie Elmes and Jenna Noel-Grinshteyn of the STEM Education Center and Office of Pre-Collegiate Outreach have welcomed two new members to campus from AmeriCorps VISTA (Volunteers in Service to America). Thanks to the work of VISTA members, WPI will be able to further expand its impact in K-12 STEM education throughout the local Worcester community. 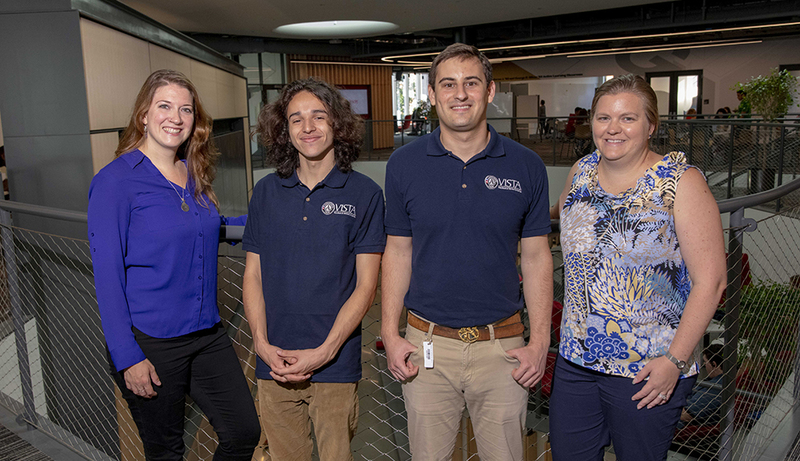 Although WPI has worked with the VISTA program in the past, this is the first time Elmes and Noel-Grinshteyn have worked with the program, after learning about it from Kathy Chen, executive director of the STEM Education Center. “When Kathy arrived on campus a year ago and saw some of the work we were doing, she thought it would be a good fit for us, too,” Elmes explains. And she was right; after an extensive application process, two VISTA members, Matthew Alvarado-Ross and TJ Madan, started their year-long service work initiative. Made possible through a three-way partnership between AmeriCorps, Campus Compact of Southern New England, and WPI, AmeriCorps VISTA members and their sponsoring organizations are committed to what’s referred to as capacity-building service work, joining forces with local communities to help eradicate poverty and acting as catalysts for change. Alvarado-Ross and Madan have STEM backgrounds, and although neither have necessarily ruled out going into industry in the future. Both care deeply about making STEM education accessible for all, which is what led to their work with the VISTA program and partnership with WPI. In the Office of Pre-Collegiate Outreach, Madan is working with Noel-Grinshteyn and her team to research how they can more effectively build up the STEM pipeline of students attending summer and academic year programs and ultimately applying to and enrolling at WPI. Building this pathway for students whose identities have historically been excluded from STEM careers is particularly important. Alvarado-Ross is working with Elmes and her team, expanding local collaborations with community partners such as the Boys & Girls Club and Worcester Public Schools. In her new role as director of equity access and community, Elmes is especially grateful for the assistance he provides. While some projects can be completed within their yearlong timeframe, they’re also building the foundation for future successes and achievements, which Elmes says will ultimately lead to a larger infrastructure being built off of their work.